When you eat or offer nuts, olives or other foods that need waste receptacles will be a lot of garbage everywhere. Here comes the solution. It's dishwasher safe and available in three colors: white and green, full green and full white. It's definitely a must have!! 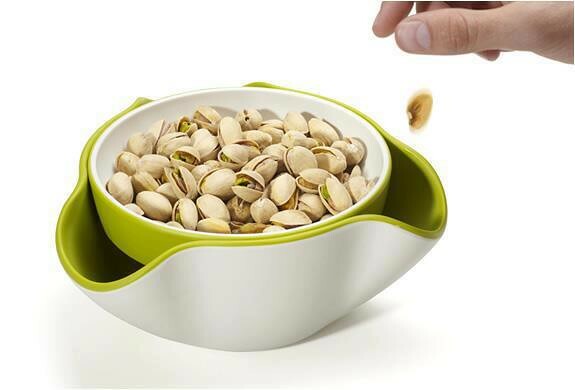 "Its unique design comprises of a serving dish sitting on top of a larger collection bowl, curved outwards in three places to allow the disposal of unsightly food waste. As well as hiding any waste from view, Double Dish™ eliminates the need for additional empty bowls on the table"